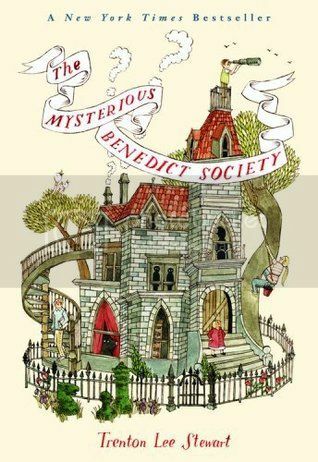 The Mysterious Benedict Society is deliciously similar to A Series of Unfortunate Events. The story follows the adventures of four intrepid orphans, each with an idiosyncratic skill set as they battle against phenomenal villain, Mr. Curtain. His twin brother Mr. Benedict is spearheading a fight against him and his mind control machine. Reynie Muldoon, a smart misfit, joins with Mr. Benedict after answering an ad for gifted children looking for opportunities. Kate becomes the MacGyver of the group, always ready with a contraption to get them out of any situation. Sticky Washington is the brains with his photographic memory and cranky Constance Contraire uses her small stature to good advantage. They manage to infiltrate Mr. Curtain's frightening island orphanage in their bid to take down his insidious propaganda machine from the inside. The story has so many wonderful turns of phrase. It captures the spirit of using language inventively, without resorting to pedantic device of using dictionary entries. Lots of thought provoking stuff about family, friendship, bravery, happiness and so on, reminded me especially of the final installment of Unfortunate Events. This book has all the elements in place: interesting vocabulary, wierd and unique spy games (Morse Code, coded messages, etc), superior villians, and a plot that races along. Loved it! The book wraps everything up rather neatly, but I didn't want it to end! Luckily, there are two more in the series that follow it, The Mysterious Benedict Society and the Perilous Journey, and The Mysterious Benedict Society and the Prisoner's Dilemma. Loved this book, too. Haven't made my way to the rest of the series yet, though. Oh good, now I know to recommend this to kids who liked A Series of Unfortunate Events. We have books 2 and 3 in my library (I can't even say how many times I've requested that we need book 1!!! Grrrrr). OMG, me too, Smalls! Our copy of book 1 is LOST, so we are forever having to request it. Maybe some kind soul will donate us a copy. Just having intrepid orphans battling evil, alone would make this a great "if you liked..." recommendation, but what totally nails it is that the vocabulary reminds me a lot of Snicket's, "a word which here means (insert silly definition here)" only more subtly done. I enjoyed it.